At StickerGiant, we love to support events of all kinds by providing custom stickers as in-kind sponsorships. Stickers are a great way to promote an event, and work well as giveaways at registration and in door prizes, giving your guests a fun way to show the world they were at your event! Check out our Sticker Stories to see some of the events we have sponsored in the past, and more about some of the businesses we work with. Our sponsorship opportunities are designed for events and charities that fall in line with the goals and values of StickerGiant. 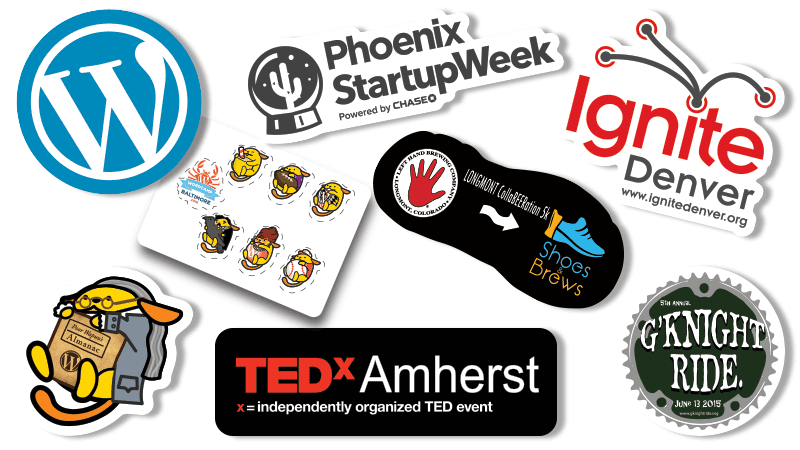 We generally offer in-kind sponsorships of custom stickers with your event design and logo. If having promotional stickers for your event and shouting us out as a Sponsor In Kind is of interest to you, please fill out the form below! We will consider all requests for sponsorships, but filling out the Request Form below is not a guarantee of a sponsorship from StickerGiant. At least 10 business days notice is requested on all sponsorship requests, to allow for printing and shipping prior to your event date. Please fill out the form below to contact our team about if we can work together for your next event.